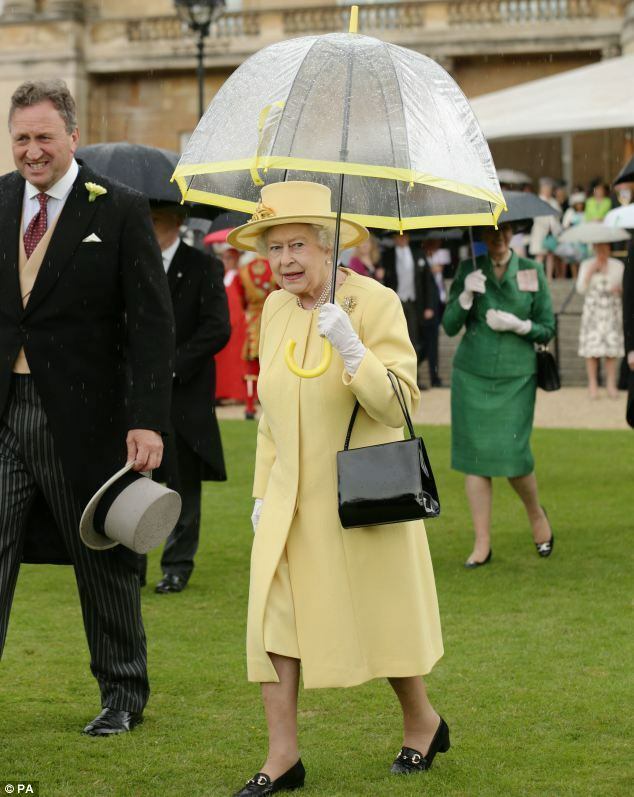 If you’re a Twitter or Facebook follower of mine, you’ll have already seen my Buckingham Palace Garden Party Hat I wore on Tuesday. 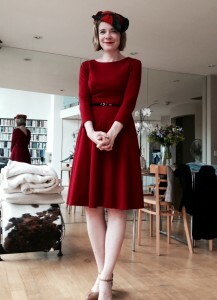 I hired my vintage 1940s tricorn number from this terrific shop run by my friend the Top Tottie herself. Hats have been a topic of conversation in our office for some time. 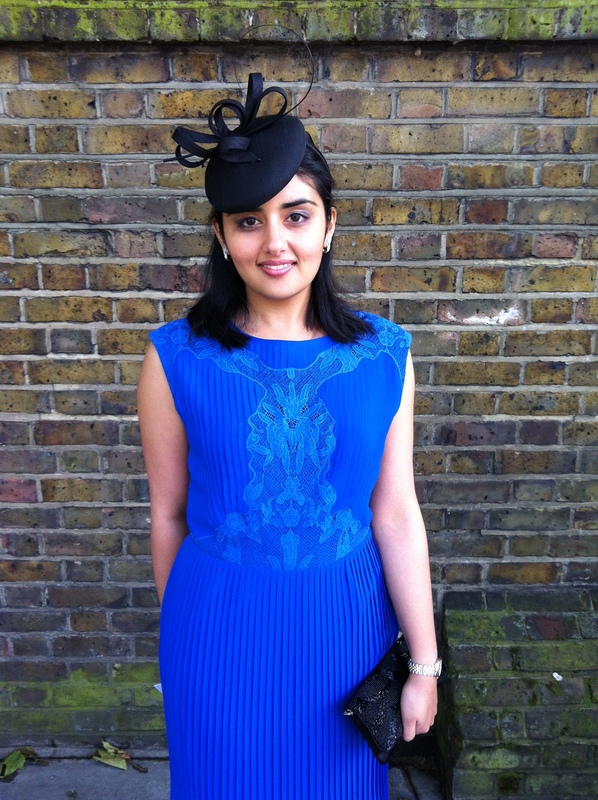 That’s because Jasmeet, our curators’ team administrator also went to Tuesday’s party, as an actual guest, and therefore also had to meet the requirement for either a hat or a fascinator. (I wasn’t there as a guest myself, I was working, on a secret project I cannot yet reveal, but, as I’ll tell you below, I have previously been to a Garden Party in my own right.) 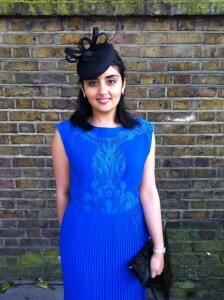 Here’s Jasmeet’s blue outfit and I think you’ll agree she looked stunning. example, would be barred from the palace. As time went on, it got harder and harder to police this sort of thing. The presentation of debutantes eventually ended in 1958 (and we had a lovely exhibition in 2008 at Kensington Palace called ‘The Last Debutantes’ in honour of the anniversary). It folded amid complaints that fixers could get you in for a price: Princess Margaret is reported to have said that change was inevitable as ‘every tart in London was getting in’. Meanwhile, Queen Victoria in later life liked to hold what she called ‘breakfasts’, summer outdoor parties in the garden of Buckingham Palace. She would invite her (several hundred) relatives, plus various courtiers, diplomats, drones of the Empire, etc., and slowly circulate among them in her landau: a very efficient way of entertaining a lot of people at once. They continued throughout the twentieth century, the largest one ever held being the 13,000 person party of 1939. Lyons, as in the Corner Houses, used to provide the teas. There are 650 employees of Historic Royal Palaces, which means that the odds are quite high – less so at smaller charities such as the Society for the Protection of Ancient Buildings. When I was working there at the age of 22, I think there were around 13 employees, and everyone had already been apart from me and next-youngest member of staff, Shahina. So we two got nominated, and off we went. 1996 now seems to me a very remote period in history. I was living in a room in Bethnal Green; that evening after the Garden Party I went to the engagement party of a couple who are now divorced; the dear old SPAB itself was several jobs ago for me. Our Garden Party that summer fell, as I remember, during both a heat wave and a Tube strike. My recollection is that Shahina deftly side-stepped the whole hat issue by wearing a sari, but that I was given The Office Garden Party Hat, round, black straw, and worn by many a SPAB employee before me. At least it went with the black dress I wore – all my clothes were funereal back then. I remember walking down the steps into the vast garden and being impressed by the sheer number of people there: I think I had naively expected about 30 or 40 rather than 8000. I remember milling about eating sandwiches and drinking the famous iced coffee and admiring other people’s clothes. At 4pm I remember the band playing God Save the Queen, and the various members of the Royal Family stepping out of the palace (this is Nash’s fabulous, cake-like, garden side of the building, not Blore’s ugly crude cliff at the front) and standing there in their bright clothes like motionless figures in a masque. Despite being a fairly lefty liberal sort of person, the theatrical quality of the occasion did make an impression upon me, and even a republican would have to admit to the atavistic power of such a sight. There’s one final thing I remember, and which I have often observed since when passing Buckingham Palace at the hour the guests pour out of the gates. As the line back into the normal world is crossed, it’s not unusual to see ladies taking off their painful high heels and walking home in bare feet. Do you have a Garden Party memory to share? I love the description of “coming out” as a debutante as “the presentation of the virgins”! I wonder what percentage were? Isn’t it also delightful that we now use the phrase “coming out” to denote people of non-standard sexual preferences telling their friends, family and the world their true orientations? From what I have read of the Georgians, none of today’s variety of sexual inclinations and practices would have been any news to them. Why did the Victorians have to intervene? Surely I’m not the only person who’s never been to a garden party? A story; when I was at school, the father of one of my friends was a Labour Councillor. He was a tub-thumping extreme Leftie whose proudest moment was when a Tory candidate in his ward had his car turned over. He once threatened me with violence just for asking a question about Russia. He was duly invited to a garden party at Buckingham Palace. About six months after the event, he gave me a lift in his car and I remarked on the sticker in the front window clearly giving him admission to this prestigious event. He said the glue was so tough he couldn’t get it off. Most elegant and knowledgeable Lucy. How can a scruffy old Aussie chap like me be invited to Buckingham Palace for a tea party? Would I need to dress like the Mad Hatter? Oh, dear. Time does run away. First I am not sure how this twitter and face book works. But I do know that because I thoroughly enjoy listening to Lucy Worsley, I came across the Historic Royal PALACES online shop. Oh, joy. Oh, bliss, Oh so much happiness. Where and when shall all the shopping end. You look lovely! I went to a garden party at the Palace last summer. I had a fabulous time and I’m sure you and your colleague will too. You’re so right about the women and their shoes after the event! I wore wedges because I didn’t want to be wobbling around with heels sinking into the mud but still my feet were in agony at the end, so off they came like everyone else’s!